Summer humidity is the bane of my existence. I loathe it, but there’s not much I can do about it. Or is there? I’ve been testing ways to reduce frizz, and I have some tips that may help. 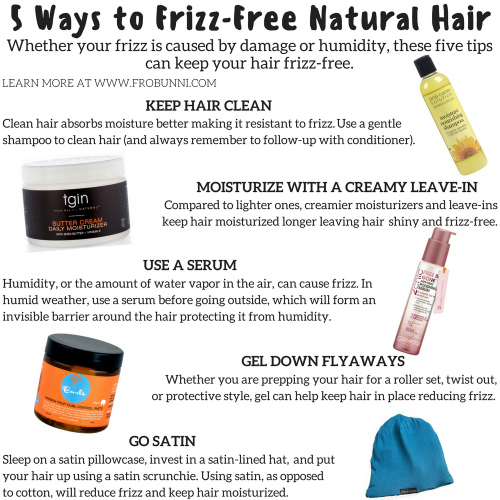 But before we begin, let’s address why frizz happens. Frizz is caused by one of two things, weather and damaged hair. Weather related frizz, usually in the form of humidity, or the amount of water vapor in the air, can affect both healthy and damaged hair. The water vapor gets in contact with hair, and your otherwise defined twist out can turn into a 10-day old wash and go. The best way to deal with this frizz is use barrier forming products, such as serums and gels, which keep water vapor from getting in contact with the hair. The other form of frizz is caused by damage. Split ends, worn hair cuticles, and dry hair make it hard to obtain a sleek rollerset and defined bantu-knot out. If you have split ends, you’ll need to cut them. If the hair shaft itself is damaged and your hair dry, you’re going to have to invest in some proper hair care. Keep hair relatively clean, deep condition, moisturize and seal daily, and sleep on a satin pillowcase. These are starting points, but I recommend learning how to build a proper hair care regimen to help reduce further damage. 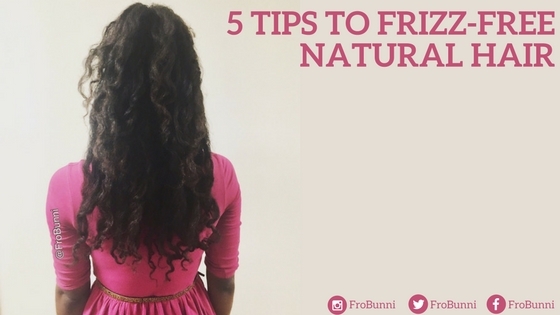 Regardless of if your frizz is caused by the weather or damage, these tips can help. Oh, and one more thing. Some frizz is normal for most naturals. So if you’re trying to obtain a super sleek hairstyle and find that it’s impossible, don't worry. It’s normal. Keep Hair Clean: Clean hair absorbs moisture better making it resistant to frizz. Use a gentle shampoo to clean hair (and always remember to follow-up with conditioner). Moisturize with a Creamy Leave-In: Compared to lighter ones, creamier moisturizers and leave-ins keep hair moisturized longer leaving hair shiny and frizz-free.